After decades of demographic and economic decline, culminating in America’s largest municipal bankruptcy in 2013, many observers were ready to proclaim that the city of Detroit was dead. But over the past several years, following successful resolution of the bankruptcy and the emergence of new municipal leadership, views have changed. Now academics and the popular press are documenting Detroit’s recovery and resilience. But does this positive image of Detroit reflect reality? Will the recovery culminate in a new Detroit that will provide all residents with a quality of life that is sustainable in the decades to come? These rosy descriptions were not consistent with the reality of what we continued to see in many Detroit neighborhoods. To provide perspective on Detroit’s comeback story, we examined trends in a variety of indicators including population, poverty, income disparities, business recovery, unemployment, residential sales prices and vacancies, and crime. Two major conclusions emerged from our data. First, by a number of measures Detroit continues to decline, and even when positive change has occurred, growth has been much less robust than many narratives would suggest. Second, within the city recovery has been highly uneven, resulting in increasing inequality. Overall, citywide data suggest Detroit is continuing to experience decline that makes it worse off than it was in 2000 or even 2010 in the depths of the national recession. Population, employment and incomes continue to decrease, while vacancies and poverty have increased. Real progress has occurred in recent years in the Downtown/Midtown core, which runs along Woodward Avenue for almost four miles and covers an area of just over seven square miles. In addition to corporate and government offices, it includes the Detroit Medical Center, Wayne State University, sports and entertainment venues, and the city’s major cultural institutions. Recent developments include restaurants, specialty retail and multifamily housing. Downtown/Midtown covers only 5 percent of Detroit’s 140 square miles, and its population of 26,000 is a tiny fraction of the 3.6 million residents of the metro area, 80 percent of whom live in the suburbs. Improvements in Downtown/Midtown have been insufficient to offset continued citywide negative trends. Less than half a mile from the GM Renaissance Center, the most visible marker of Detroit’s downtown (motto: “Reflecting a new Detroit”), empty lots, weeds and dilapidated buildings prevail. The Hudson-Webber Foundation’s 7.2 Square Miles report highlights the concentration of positive activities in the Downtown and Midtown areas of the city. Although home values in Midtown have increased by 5 percent since 2008, this has not been sufficient to offset continued weakness in other neighborhood housing markets. Even in Midtown, poverty remains high and most new jobs are going to suburbanites. Increasing income inequality in Downtown/Midtown suggests that concerns raised by University of British Columbia geographer Jamie Peck about creative class-led gentrification are real. The pace at which revitalization is spreading to adjacent areas is far too slow to eliminate divisions between downtown and neighborhood, city and suburb (read: black and white), or rich and poor in the city. One important data point is the share of jobs in the city actually held by Detroiters. At each geographic level, the number of jobs held by residents has dropped over time, while employment of non-Detroiters has increased. Recent increases in jobs in the city appear to have benefited workers living in the suburbs, many of whom are white. Growing inequality and polarization are captured in the metropolitan landscape. 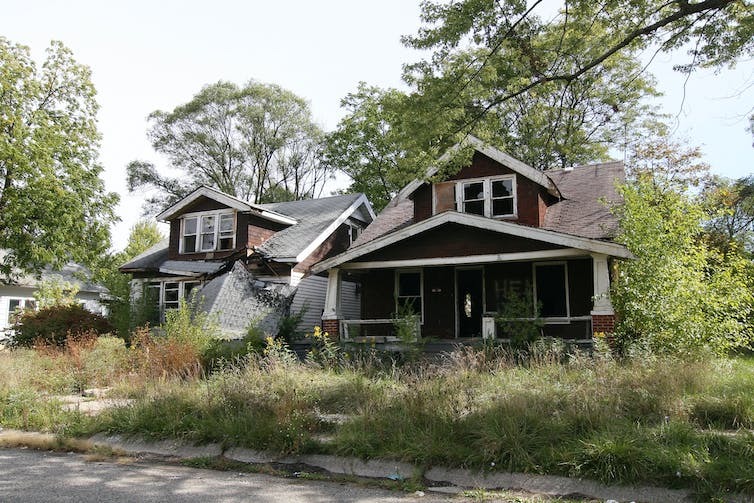 Detroit is two very different cities – one white and privileged, the other black and deprived. Large-scale purchases, refurbishments and upgrades in Downtown/Midtown by developer and Quicken Loans Inc. founder Dan Gilbert contrast sharply with the decay that continues to dominate post-apocalyptic neighborhood landscapes, inhabited by long-time Detroit residents who are not sharing in the city’s growing but highly limited prosperity. The complex problems of Detroit’s neighborhoods require comprehensive, multifaceted revitalization strategies. Brookings Institution scholars Alan Mallach and Bruce Katz have outlined holistic approaches to revitalizing legacy cities. In addition to maintaining economic growth strategies in Downtown/Midtown, current neighborhood policies need to be continued and expanded. Policies to increase human capital throughout the city, including improving public education and expanding employment and entrepreneur training, must also be adopted. Perhaps the most important short-term strategy is increasing employment levels among Detroit neighborhood residents. A healthy, sustainable local economy would require the number of Detroiters with jobs to grow by as many as 100,000. Even if these jobs paid just $10 an hour, they would add more than $2 billion annually to the local economy, an amount equal to approximately half of the total payroll for all private sector jobs in the neighborhoods in 2014. This new purchasing power would generate additional demand for retail and commercial services, and strengthen the effective demand for affordable rental and owner-occupied housing. Multiple initiatives and considerable time will be needed to foster job growth on this scale. Detroit residents need better transportation to existing job opportunities in the city and suburbs, and job training for a variety of careers. Efforts to foster entrepreneurship must be matched with increased access to capital so that new businesses can thrive. In the long run, a sustainable recovery will require significant public education improvements. For decades, under both local and state control, the Detroit public schools have been more successful at accumulating deficits than at educating students. Students have left the district by the tens of thousands to seek a better education, either in charter schools—often no better than the schools they left—or in suburban districts. Detroit just seated its first locally elected school board in seven years, which could be the first step toward improved educational opportunities for all Detroit children. Investing in public schools, improving public transportation, providing services to neighborhoods, and supporting development programs that provide start-up or revolving loans, entrepreneurship support, business incubators and job skill training will require substantial public resources. Detroit does not have those resources now. One option to address the revenue shortfall would be to reevaluate existing tax abatements, tax increment financing and neighborhood enterprise zones, which lower tax rates, often in higher-income areas. All of these programs tend to divert revenue out of the general fund and into the private sector. Reducing or restricting such expenditures would help Detroit avoid forgoing revenue that it could be spending on services and programs. Without a significant commitment to improving education and job skills throughout Detroit, the gap between the city’s core and its neighborhoods will continue to widen.